Walsall skipper Andy Butler headed a second-half winner at Molineux to shatter Wolves' 100% home record. The visitors went close in a fiercely competitive Black Country derby when Craig Westcarr's free-kick hit the bar. But Walsall got revenge for their JPT exit at Molineux a fortnight ago when, on 69 minutes, substitute James Baxendale hooked back Andy Taylor's cross for Butler to nod in the winner. Walsall's only previous league triumph at Molineux came in August 1999, when Andy Rammell hit the winner in a 2-1 away victory, but they also won there in the League Cup in 1985. Walsall sub Milan Lalkovic's free-kick then hit the post in the last minute. Wolves had a first-half effort from Bjorn Sigurdarson, which flashed across the face of goal without anyone getting a touch, as did another similar effort from Bakary Sako, who also forced a good save out of visiting keeper Richard O'Donnell with a 30-yard free-kick. 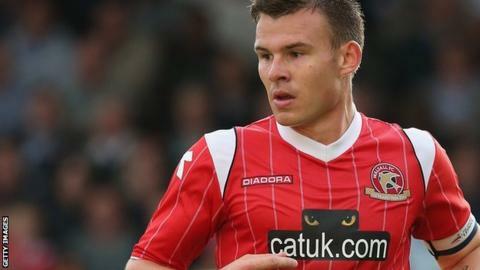 O'Donnell then came to Walsall's rescue again on the stroke of half-time when he pushed out Kevin Doyle's header from Sako's corner as Wolves crashed to their first league defeat under new boss Kenny Jackett. Walsall's second away win in four days lifts them up to seventh in League One. Wolves, whose run of five straight league wins came to an end, remain third, having missed the chance to go back up into second. "After an even first half, we had all the territorial advantage in the second half but didn't create enough chances. "I'm just disappointed that we lost to a set piece. Our marking on the far post wasn't good enough. "Walsall just edged it and my task now is to make sure that we're better than that. Saturday's Shrewsbury game now becomes a very big game." "It's a difficult place to come, against quality players, and we've restricted them to not many efforts. Our three-man midfield in particular were outstanding. "We've made 2,500 Walsall fans very happy. But we have to keep reminding ourselves that it's only three points. "We've now got two tough games coming up against Rotherham and Orient, who are both unbeaten, and that should help bring us back down to earth."